This heavy duty 71" Loop Style bike rack has the popular modern design and is economically priced. Made of galvanized 2 3/8 inch O.D. schedule 40 pipe. This 5 loop bike rack has space for 7 bicycles, one bicycle per loop and one at each end. Comes as surface mount for semi-permanent placement. 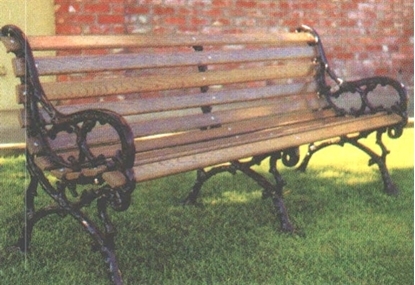 60" Woodland Contour Bench Wooden with Powder Coated Cast Aluminum Frame, Portable 91lbs.